Here at National Industrial Engravers we stock an Aluminium Wallet. “OUR PRICE $15.00” and that includes engraving and postage. The same one as seen on the TV shop network advertised for $50 + $9.95 postage and handling. I have searched the world and found the manufacturer of the Aluma Wallet and obtained them direct. then I will engrave them, package them and post them “FREE OF CHARGE”. This offer is not limited to the first 50 callers nor for a limited time, it is the regular price that I sell them for. I challenge anyone in Australia to better this offer. FREE ENGRAVING, POSTAGE AND HANDLING, No waiting time for delivery and I have more than 2000 in stock. If that’s not cheap enough and you’re interested in purchasing a quantity of these, I will make them “EVEN CHEAPER” yet again. 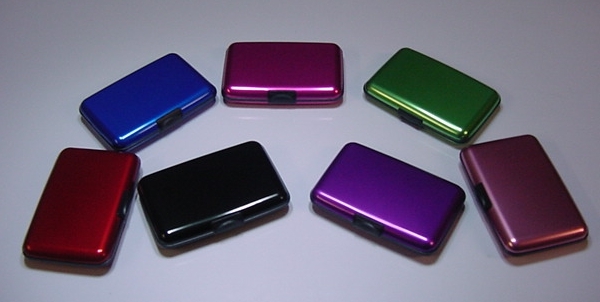 The aluminium wallet is the ideal present, corporate gift or simply an advertising tool for your business and its services. You won’t find these Aluma Wallets for a better price in Australia, and certainly not from a trusted business like National Industrial Engravers. We offer some of the best engraving services to all of Australia, with a great range of products, skilful engraving and a reputation for quality. Whether you need rare earth magnets, memorial plaques or engraving services, there’s no one better than the team at National Industrial Engravers. Contact us today to get your Aluma Wallet or one of our other products.